ships, whose main armament consisted of 8 universal 100 mm caliber guns with excellent ballistic characteristics. 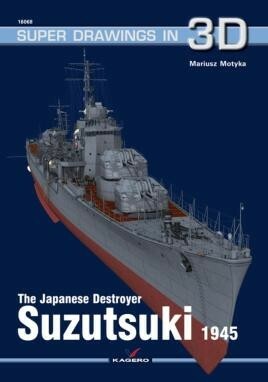 The Akizuki destroyers were designed before the beginning of World War II as anti-aircraft ships for fast Japanese groups of aircraft carriers. They were completely different from the previous Japanese destroyers, in which the emphasis was put on strong artillery (127 mm guns) and torpedo armament. They were inspired by the British Dido class light anti-aircraft cruisers, however, in contrast with them, the Akizuki destroyers were medium size ships intended for anti-aircraft defense of groups of fleet. Once again, Kagero have supplied a vast amount of information, not usually available visually in photographs by using the CGI format.